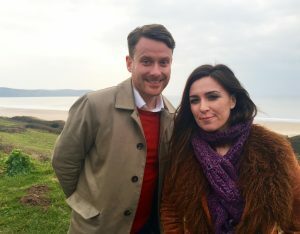 Coast Vs Country is Channel 4’s brand new property series from the creators of A Place in the Sun, helping house hunters find their dream property either by the sea or in the countryside. The series is presented by interior designer, Kerr Drummond and buying expert and current face of A Place in the Sun, Sara Damergi. Kent features throughout the series including Thanet locations Broadstairs & Viking Bay, Joss Bay, Kingsgate Bay, Margate, Ramsgate, as well as Canterbury and Herne Bay. The Thanet area boasts the beautiful coastal towns of Broadstairs, Ramsgate and Margate which has sandy bays, parks and open spaces, galleries and amusements. Thanet has been used for filming by productions such as The Lady in the Van (2015), Eastenders (2015) and The Hotel Inspector (2012). Herne Bay is a seaside town which has a pier and shingle beach and is set just outside of the historic City of Canterbury. Previous productions which have filmed in the area include Rustom (2016), Terry and Mason’s Great Food Trip (2015) and Got To Dance (2012). This entry was posted in Filmed in Kent and tagged Broadstairs, Canterbury, Coast Vs Country film locations, Herne Bay, Joss Bay, Kingsgate Bay, Margate, Ramsgate, tv factual, Viking Bay. Bookmark the permalink.